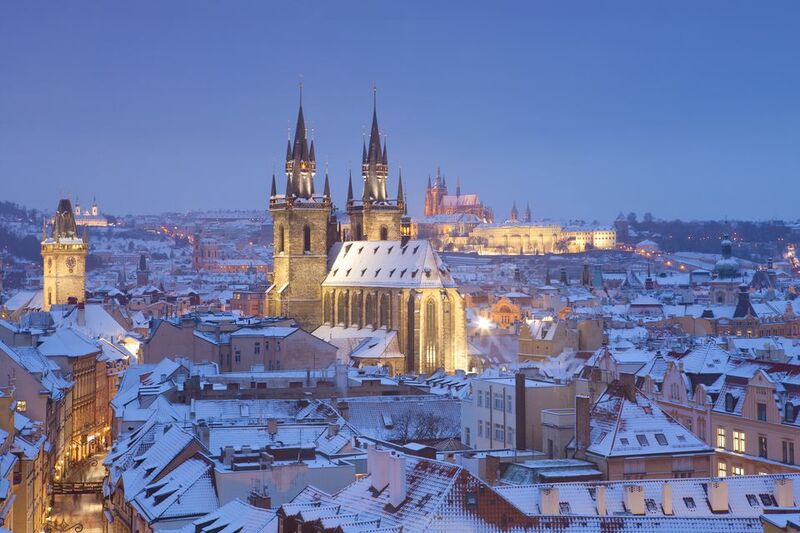 Winter in Prague is one of the best times of the year for travelers. December marks the beginning of the Christmas season, January is welcomed in with the thunder and lights of fireworks displays, and February brings with it Valentine’s Day to make a romantic city even more attractive to lovers. Though the weather is chilly, visitors to the City of a Thousand Spires can warm up in pubs, cafes, and museums, and evening concerts provide plenty to do once the sun sets. Winter weather in Prague is cold, often below freezing. Snow is possible, though on average, the city sees an inch or less of precipitation in the months of December, January, and February. Visitors to the city during this time of year should bundle up. Many sights are best seen on foot, and a tour of the Prague Castle grounds, for example, will necessitate warm shoes, gloves, scarf, and hat. Layers are your best bet for clothing options. Shirts under sweaters, warm socks under boots, and a long coat that protects against the wind well will go a long way to keeping you warm and cozy while shopping at Christmas markets or enjoying holiday lights after sunset. If you’re prone to cold hands, warm gloves are a must. You don’t want your hands in your pockets in the event the sidewalks get icy or slick with snow or rain; you’ll need them to break your fall. The Prague Christmas market is a favorite event for winter travelers to the city. It serves as a month-long cultural experience for visitors, who shop for handmade decorations and gifts, taste Czech holiday pastries, and enjoy open-air musical performances. Other events and holidays include St. Nicholas Eve on December 5th, New Year's Eve, the Three Kings procession on January 5th, Valentine's Day on February 14th, and the Czech farewell-to-winter festivals in the form of Masopust and Bohemian Carnevale at the end of February or beginning of March. Prague offers plenty to see and do during December, January, and February. Everyday activities that are perfect for winter weather travel include museum-going (Prague has more than art museums, though art from all eras is well represented) and relaxing in historic cafes. In the evening, enjoy the music that fills concert halls and churches in the historic district. You can also view Christmas decorations, go ice skating, or visit special holiday exhibitions. Seasonal activities include Christmas-related events, markets, and concerts, and the city-wide celebration on New Year’s Eve. If you’re going to be in Prague for Valentine’s Day, look for romance packages at hotels or special dinners offered by the city’s best restaurants. December does attract a good number of travelers who know that the Prague Christmas market is one of Europe’s best, so plan well in advance if you want to travel during this month. If you’re visiting the city especially for the Christmas market, it makes sense to book a room near Old Town Square, which will make getting to the Christmas market easy. A similar warning can be issued for New Year’s Eve. Tickets for parties and events go on sale early and sell out in advance. Consider how you’d like to spend New Year’s Eve in Prague and seek out tickets you can purchase online. Of course, you can always head to Old Town Square or Charles Bridge to watch the fireworks display outside. Or, if your hotel has a good view, you can stay warm indoors or pop out onto a balcony to ring in the new year. January and February see fewer tourists, but Valentine’s Day weekend will see an upsurge in visitor numbers. If you see a hotel package that you really like, snag it up before it’s gone. Some of these will put you in the heart of the city, allow you to take advantage of the charm of a boutique hotel inexpensively, or offer amenities sure to make your visit to Prague relaxing and romantic. Also remember that hours of operation for some attractions in the city, as well as attractions in destinations outside of Prague, may be shortened for the winter months.